﻿ MINI SWISS ROLL CAKE!! 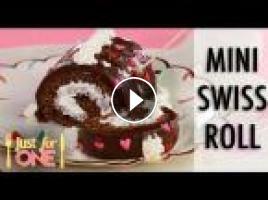 How to Make a Chocolate Roll Cake Recipe JUST FOR ONE! Fun, pint sized recipes designed JUST FOR ONE! This Chocolate MINI Roll Cake is the perfect single serving! There's always an upside and there's always a downside but let's all agree to focus on the Sweeter Side!